A very well-done full-length animated movie set in the fictional world of the Batman, where a new costumed vigilante is prowling Gotham – with a total disregard for human life. Batman has a list of three suspects to deal with, while trying to stop the machinations of the Penguin, Rupert Thorne and a crime boss. Is the female of the species more deadly than the male? Read and find out! 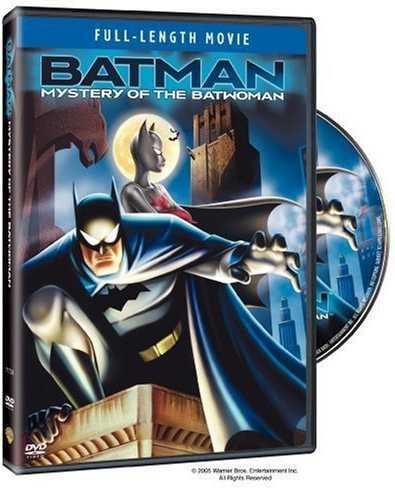 Batman : Mystery of the Batwoman is a very entertaining film, set in the world of Batman : the Animated Series. It begins with the Batwoman of the title disrupting an arms shipment. But she does so with a total disregard of innocent bystanders, as well as being willing to use lethal force. Fortunately, Batman and Robin (the third Robin, Tim Drake) happen to be flying by and prevent a semi truck falling off a bridge from killing innocent bystanders. It soon becomes clear that Batwoman, voiced by Kyra Sedgwick, is on a mission of revenge against the Penguin (voiced by David Ogden Stiers). She is also hunting his partners in his current criminal activity, Rupert Thorne and Carlton Duquesne, the ‘muscle’ of the trio. Batman, with the aid of Alfred (Efrem Zimbalist Jr.) soon has three possible suspects. Kathy Duquesne (Kimberly Brooks), who blames her father for her mother’s death in a gangland attack years before. Detective Sonia Alcana (Elisa Gabrielli) whose parents’ building was destroyed by arson as part of Thorne’s protection racket years ago. There are several sub-plots running as well, including Bruce Wayne’s attraction to Kathy Duquesne, Kathy’s relationship with her father, as well as the gun-running operation to the tyrannical nation of Krasnia that the Penguin is trying to mastermind. Towards the end, the Penguin decides to hire the deadliest muscle available to deal with the ongoing incursions of Batwoman. 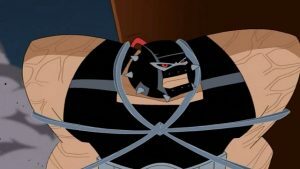 Bane (voiced by Hector Elizondo). Comic book fans remember as the man who broke Batman’s spine several years ago. Overall, it’s a very enjoyable film — I recently watched it with my9-year-old son, who’s a fan of all things superhero in general and Batman in particular, and he was wildly enthusiastic. There was enough action to keep him entertained, as well as having a contest with his 11-year-old sister to see who could solve the mystery of who the Batwoman was … although they were both wrong in the end. It’s well done. 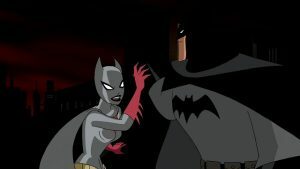 If you’re a fan of Batman: The Animated Series, you’ll enjoy it very much. Several of my favorite actors (Hector Elizondo, Kyra Sedgwick, Bob Hastings, David Ogden Stiers) were voicing several of the roles, making it more enjoyable. I’ve never been a fan of Kelly Ripa, but I was pleasantly surprised by her performance as well. I rate Batman: Mystery of the Batwoman 4 stars out of 5, and I hope that you enjoy watching it as much as my children and I did.